I finally got around to watching the 2014 film, Need for Speed, starring Aaron Paul and based on and around the video game by Electronic Arts. It's directed by Scott Waugh (Act of Valor). 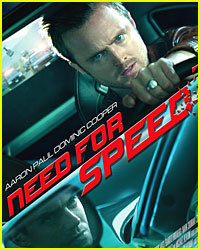 This movie is all about the cars and the street racing with them, much like the video game. In between all the horribly dangerous road racing scenes, there's actaully a story peppered there. Sort of. Remember, there's always a reason to go fast until someone gets killed Then there's even more reasons to race about it. And that is the short of it, if you were curious. Paul plays street racer Tobey Marshall, who owns a down and out auto customization shop, hired by a rich race driver and rival, Dino, played by Dominic Cooper, to build a custom Mustang. One thing leads to another, and while the three of them (Tobey, Dino and Tobey's little brother Pete) are racing, Dino taps out Pete, killing him. And then he drives off. Tobey is arrested for the death of Pete for involuntary manslaughter after no one can prove that Dino was there. Once Tobey gets out, he ends up racing against Dino yet again. This time, it's not just about the race, but about what's right. It's not a horrible story but some of the execution missed the logic and the point. It felt like a different film we may have all seen, with Tobey driving crazy to go across the country to get into an underground race. Overall it feels like a different version of The Fast and The Furious franchise, so they're late to the party of making a car chase/race movie. What I did enjoy was watching Aaron Paul breaking out of his Breaking Bad character that he's been known for of late. I think this is a fine film for when you have nothing else to do and you like watching cool cars flying all over the place, I think you'll enjoy the flick. But it's not rated that well with Rotten Tomatoes, where the prof critics gave it a 23%. But the RT audience gave it a 57% and on IMDb users gave it a 6.5 score. You be the judge, if you want.